An IT professional with expertise in games and gaming equipment. Grand Theft Auto IV is the sixth title in the Grand Theft Auto series of games to make its way to the PC. It was released on December 2, 1998, seven months after the release of the Xbox 360 and PlayStation 3 versions were released. 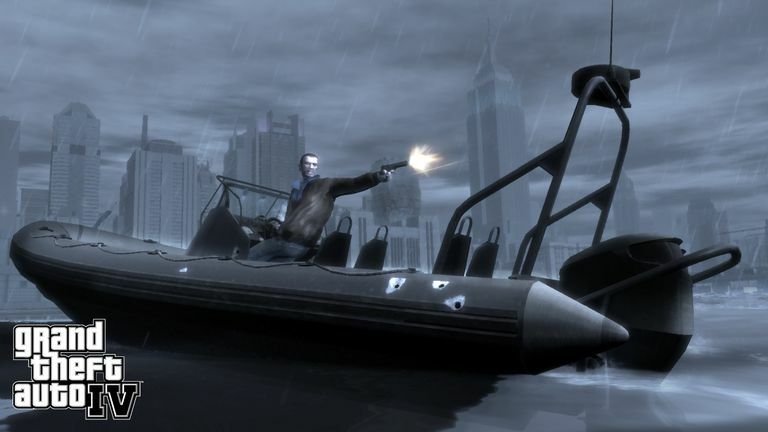 In the game, players take on the role of Nikolai "Niko" Bellic an illegal immigrant who arrives in Liberty City in hopes of starting a new life. Soon after arriving in Liberty city Niko is forced into taking on jobs for one of the several criminal organizations in operation within Liberty City to help his cousin pay off some gambling debts. Similar to other games in the series, players can expect to spend plenty of time hijacking cars, shootouts with police, and mingling with street life of a big city and members of the criminal underground. Pros: Living city of Liberty City; compelling storyline with endless hours of gameplay; Robust multiplayer modes. Cons: Suspect AI; Some Gameplay mechanics better with GamePad. Grand Theft Auto IV returns the series to Liberty City, the same setting for the original Grand Theft Auto and Grand Theft Auto III, however, it's a vastly different place since then, Liberty City is a living and breathing game world that is a primary piece of the gaming experience in Grand Theft Auto IV. Completing the story based missions for the campaign will get a player some exposure to the open world concept but that is only the tip of the iceberg. Getting to the full experience requires you to go off script and dive into side missions and simple exploration to see what Liberty City has to offer. After a hard day of theft, gunfights, and murder, Niko (and players) can take some much-needed downtime and partake in mini-games of bowling, darts, and pool at a bar. If bar games aren't your thing, not to worry there are plenty of other things to do in Liberty City to keep you busy. Surf the net at an internet cafe, go on a date, steal more cars and much more, both deplorable and respectable. Many of these activities can also lead to bonus rewards and items for use later in the story campaign. That's not to say that Grand Theft Auto IV story campaign is something that should be skipped in favor of spending time in the open world. On the contrary, it is a deep character-rich story that keeps you engaged throughout. Similar to other games in the series, players accept and receive various missions all of which include some sort of illegal activities such as drug deals, kidnapping bank heist and even killing people. Niko has military training in his background, which comes in handy when the gangs hiring him are trying to knock off opposing gang members. Players are presented with a number of moral decisions, and every decision they make can have game-altering consequences. Rather than kill someone they are hired to kill, players can let him go as long as he promises to never show his face again. That can be a risky proposition for players, though, if they are found out to have a soft heart it may come back to hurt them in the long run. For the most part, Grand Theft Auto IV gameplay is very similar to other titles in the series. The game is played from the third-person, over the shoulder perspective and is set in an open world that gives players an enormous amount of freedom. New features/abilities include ability to climb/scale walls and fences, taking cover behind objects and a target locking feature which is a feature that is better used when playing with a gamepad versus the accuracy of keyboard/mouse. Completing missions that involve grand theft, bank robberies, and murder are bound to get the attention of the Liberty City Police Department. That being said, police do seem a little laxer in GTA IV compared to other games. The GPS tracking map shows you the location of patrol cars and ​beat cops on foot in your vicinity. To avoid drawing their attention to arrest or chase after you all you have to do is move to an area where they are no longer displayed and stay there for a few seconds before moving back. This brings the game's AI a little into question but it is not overly necessary as many of the dangers facing Niko come from the rival gangs rather than the police. Grand Theft Auto IV also contains a multiplayer component which is larger in scale compared to previous games allowing for up to 32 players to roam freely through Liberty City there are competitive deathmatch modes, street races and co-operative game modes are available as well as a free model which has no primary objective or mission. The multiplayer component includes a level system allowing them to gain rank and in-game items. The praise for Grand Theft Auto IV has been universal with both fans and critics alike. The open world of Liberty City is unlike any to date and the main character is both likable and has a compelling background, which is a change of direction of the typical thugs and lifelong criminal that many players are accustomed to from a GTA game. The game has modest system requirements (by 2015 standards) yet the visuals are stunning; character movement, animation, and the story cutscenes mesh together flawlessly to make Grand Theft Auto IV a special gaming experience. Play Grand Theft Auto 2 for Free! Can your old PC Run Grand Theft Auto III? What are the Best Crime Games for the PC? What Are the System Requirements for 'GTA: San Andreas'?